Wow! It's 2019 and Angel City Press has hit the new year running. We've got lots of exciting news to share with you, and we hope to see you at one of our events this winter! Author Robert Inman discusses and signs the revised 6th edition of An Architectural Guidebook to Los Angeles at 5:00 PM on Sunday, January 27 at Skylight Books. More info here. April Dammann, author of Exhibitionist and Corita Kent: Art and Soul speaks about "Earl Stendahl: Champion of Female Artists at the Stendahl Gallery of Los Angeles" at Pasadena Museum of History on January 29 from 6:30 pm to 8:00 PM. More info here. Angel City Press authors will be appearing at the Rancho Mirage Writers Festival. Josh Kun, author of Songs in the Key of LA and To Live and Dine in LA, discusses migration on Thursday from 1:00-1:45 PM. More info on the festival program can be found here. An Architectural Guidebook to Los Angeles was reviewed by David Ulin in the Los Angeles Times. Angel City Press was featured on C-SPAN BookTV! You can watch interviews with publishers Paddy Calistro and Scott McAuley, as well as authors Lynell George, Patt Morrison, and Jim Harris. Stephen Gee, author of Los Angeles City Hall, Los Angeles Central Library, and Iconic Vision, won a Golden Mike award for his documentary "Iconic Vision: John Parkinson, Architect of Los Angeles"
Angel City Press authors Rachel Surls and Judith Gerber (From Cows to Concrete) and David Boulé (The Orange and the Dream of California) will appear on LA Foodways, which airs February 6 at 8 PM on KCET in Southern California, and the six digital episodes can be streamed on kcet.org/lafoodways. Angel City Press now distributes books published by Huntington Library Press. More information on those titles can be found here. That's it for now! Happy reading, and we look forward to seeing you soon! 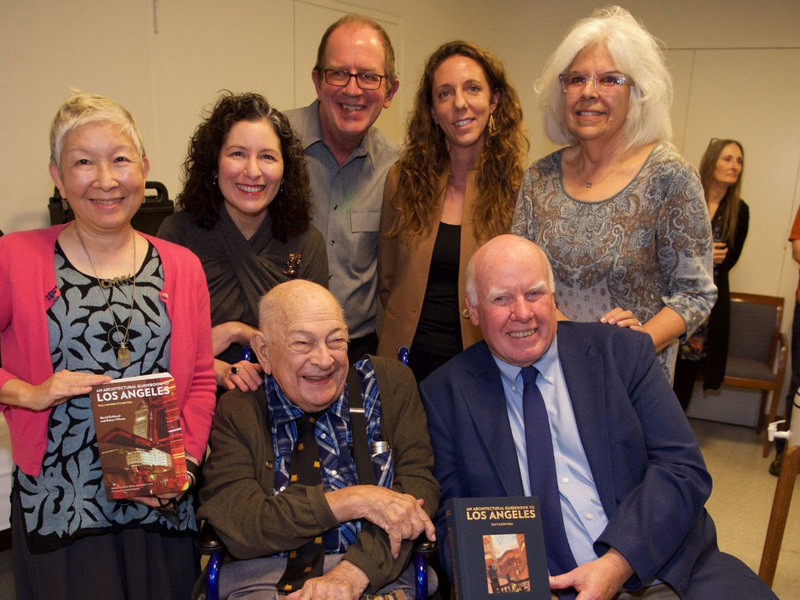 Dr. Robert Winter, bottom center, and Robert Inman, celebrate the launch of the iconic An Architectural Guidebook to Los Angeles with the Angel City Press team at Occidental College on December 9, 2018.